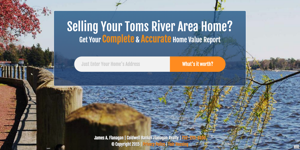 Search ALL Toms River Homes! Welcome to "Toms River Today"! For the latest opinion(s) about Toms River real estate, Toms River places and Toms River people, bookmark this blog! How does an Agent recognize an opportunity? If you want to be a successful real estate professional in Toms River, NJ, one of the things that you’re going to have to do is be able to recognize opportunity when it knocks. An opportunity to fill a much needed gap in the market or to change your business to take advantage of a trend could mean the difference between a little bit of success and a huge amount. But you must know what these opportunities look like so that you can grab them when you see them. Here are three ways to recognize an opportunity. One of the earmarks of a good opportunity is that it doesn’t sound too good to be true. A true opportunity that has great potential isn’t going to be perfect when you encounter it. You’re going to have to do the work to make it into a successful strategy. However, one thing that it should have is potential. If you can see it becoming a great idea in the future than it might just be the opportunity that you been looking for but just be sure that just because an idea is imperfect that you don’t discard it completely. Some of the best ideas that have ever been thought of were completely different takes on what a product or service was originally intended for. The idea might’ve been a failure as it was intended but it sparked an entire new thought process and brand-new applications. These accidental inventions ended up being something completely different because someone had the ability to see past the original application. For example, both the slinky and silly putty toys were intended for industrial application. However, they failed as intended and instead became some of the most popular toys ever invented. Looking for more good opportunities for your real estate business in Toms River? 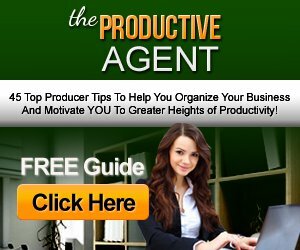 Pick up a FREE copy of The Productive Agent: 45 Top Producer Tips To Help You Organize Your Business And Motivate You To Greater Heights Of Productivity. Ocean County Open House Weekend! This weekend is the county-wide, “Open House Weekend”, sponsored by the Ocean County Board of Realtors. Real estate brokers and agents throughout Ocean County will be holding Open Houses on both Saturday & Sunday, April 9th & 10th. We've taken the liberty of trying to make your life a little easier by "filtering" out the Open Houses in Toms River, NJ, and "filtering" them even further into segmented lists. Below, you will find the open houses in Toms River, listed by property type (single family, condominium and adult community). Single Family Homes being held OPEN in Toms River! Condominiums/Townhomes being held OPEN in Toms River! Adult Community Homes being held OPEN in Toms River! Toms River your first choice but willing to look somewhere else too? CHECK OUT the segmented lists of OPEN HOUSES on our sister site, FlanaganRealty.com! It's official. As of March 18, 2016, "ORDINANCE of the Township Council of the Township of Toms River, Ocean County, New Jersey, Establishing Cease and Desist Zones Prohibiting Real Estate Canvassing." Exactly where are these "Cease and Desist Zones" in Toms River? There are two zones (Zone 1 and Zone 2) located in the North Dover Section of Toms River. "The area bounded by the Lakewood and Jackson borders to the north and northwest, State Hwy. 70 to the south, and Whitesville Road (County Rt. 527), to the west. "The area bounded by the Lakewood border to the due north, State Hwy. 70 to the northwest, New Hampshire Avenue to the east and southeast, and by Whitesville Road (County Rt. 527), Riverwood Drive, U.S. Route 9, and Silverton Road to the south and southwest." These "cease and desist zones" will shall remain in effect for 5 years from their effective date. Why & How did Toms River "Outlaw" Real Estate Soliciting in Toms River? How do I know how much my house is worth in Zones 1 and/or 2 in Toms River? 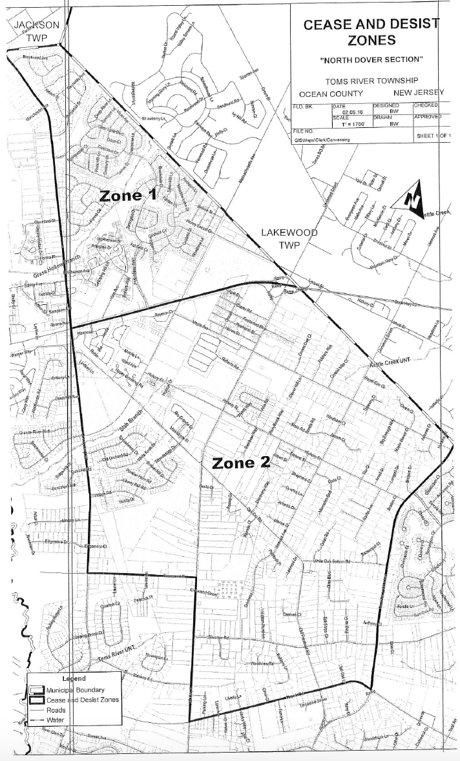 For the next 5 years, these 2 zones in the North Dover Section of Toms River, are "Real Estate Canvassing Free" zones. Don't worry, you will be receiving plenty of OVER-SIZED real estate postcards, from a variety of self-professed, "North Dover" experts, all telling you to "call them". How 1984 of them! So, if you live in one of these zones and want to know how much your house is worth but you DON'T want to call anyone, CLICK on the IMAGE below! Live in Zone 1 or 2 and want to sell your home? Unfortunately, because of all of the controversial publicity surrounding the Township of Toms River's decision to create and enforce this latest ordinance, many residents of these 2 "Anti-Real Estate Soliciting" zones feel intimidated about selling their homes. For a CONFIDENTIAL and discreet "home selling" consultation, CLICK HERE! Stay tuned for further updates about what's happening in Toms River real estate and the Toms River community by "book-marking" this blog. Top O'the Mornin Toms River! After nearly a decade of decline, the Toms River real estate market is finally coming back and it's coming back strong. Now, before you get all giddy and think your home is worth what it was in 2005/2006, let's put things in it's proper perspective; by coming back, I mean even though home prices in Toms River have increased (7% in 2015), we still have a ways to go and some local challenges to over-come. Waterfront Homes (Superstorm Sandy is still affecting a third of our local housing market). First Time Home-Buyers (College debt and limited employment opportunities are affecting this segment). The "Move Up" Buyer (Although their equity is slowly returning, their selection of available and affordable inventory is limited). Amidst all of the changes that have taken place in Toms River, over the last few years, the most consistent and yet surprising changes involve our local restaurants and watering holes. We said "good bye" to Tiffanys (Closed), The River Market (Moved) and Mulligans (now Pub 1850), to name a few. We said "hello" to Buffalo Wild Wings, Social 37 and Bahama Breeze. My plan is to post a "Video Review" a week, so stay tuned! Last (today) but certainly not least, are the "people" who make and sometimes shake Toms River. If you haven't heard of Jeremy Grunin yet, you will soon! Jeremy is a very busy guy. As head of the Jay & Linda Grunin Foundation, Jeremy is obsessed with making Toms River better. Well, that's it for today. I wanted to keep it short and sweet (this time). Look for more Toms River real estate, Toms River places and Toms River people soon! Thank you for finding me, coming back and SHARING this site with anyone and everyone who loves to call Toms River, "home".